This article uncovers the most promising methods of activating wealth using the correct type of water feature practiced by Classical Feng Shui Masters. Almost all who had seeked for feng shui masters to audit their homes would have been recommended to incorporate water into their home interiors and gardens. Water, being one of the 5 elements itself, can be used to invoke the producing or exhausting cycle of 5 Element method, to cure problems or activate luck. Water is also the most powerful and promising method of activating "water stars" in the classical Flying Star practice. Almost all the time, we have discovered that feng shui enthusiasts have a wrong understanding of the correct type of water feature to be used in feng shui. Water taps, bathtubs, jacuzzi, toilet bowls, sinks and toilets are not considered as water features. They are wash areas and drainage systems that drains away energy, including draining away all types of luck, good or bad. In feng shui, there are two types of water features. One is known as the "yin water" feature, which does not have living fish or plants in it. It is a bowl of still stagnant water with nothing inside except water. This type of water feature is usually used to exhaust metal or fire energy. In the bagua orientations, if south, west and northwest locations are afflicted, the yin water can be used to cure almost all types of afflictions located there. In the practice of Flying Stars, the violent star#7 (with metal base element) can also be exhausted with this type of water feature. On the other hand, the other type of water feature known as the "yang water" feature, is moving, active and filled with life energy. This type of water feature can be natural or man-made. Natural ones will use the movement of stocked fish to liven up chi in it. Plants which oxygenate a bowl of water can also be considered a "yang water". Man-made ones are fountains, spouting water, rolling ball water features or aquariums which are pump activated. This means "yang water" feature is moving and there is life within. However, we would like to caution that not all "yang water" feature available in the market are auspicious or would give desired feng shui results. In fact, we have had many customers showing us how their inauspicious yang water features had brought disasters to their feng shui which had led them to a series of bad luck. A good example of "inauspicious yang water features" is one that appears to have a mountain sinking in water. Remember that when mountain sinks in water, it could signify disaster in business relationships, poor communication and hatred from peers. Other types of bad water features include those that do not follow feng shui design, for example strong water rushing down steeply, wrong number of water steps used in fountain design, sharp and protruding edges piercing through chi accumulating water, water features that signify poverty etc. It is also worth taking note that Wealth Gods and Wealth Deities must never be placed above aquariums or water features. Wealth deities on water signifies instability and potential falling of wealth, which may bring seriously disastrous results and bankruptcy. A good water feature designed for feng shui purpose is usually conducive to generate energy and accumulate chi so that prosperity can flourish. Feng Shui Masters often would incorporate good fortune symbols to ensure that desired results would realize. Examples of good fortune symbols are lotus, gold ingots, dragons, tortoises, money frogs etc. However, it is not appropriate to get those that have Wealth Deities such as Laughing Buddha sitting on top of the water feature. Wealth Deities on water signifies instability of wealth and brings poverty instead. Some more immaculate feng shui masters would even seek for good material used to make water features so that they will not leak when they get worn out. Examples of water features that wear out and potentially leak later are those made from fibre that is widely available in the market today. The better ones are made from ceramics, porcelain and the best ones are carved out of precious stones, such as crystals. In terms of the movement of water, the best and most desired type is the one that has a rolling ball mechanism incorporated in the water feature. The one endorsed to be correct for prosperity enhancement by classical masters is such as the one shown in the picture below. It is a natural crystal carved in the shape of a lotus which emits auspicious vibes which radiates further to be accumulated in the water that flows down into a bowl. Meanwhile the rolling ball which is also carved from natural crystal attracts, regulates and rejuvanate chi to be dispersed around its vicinity. The rolling ball is also the best means to activate auspicious water star #8 in Flying Star Feng Shui. It represents never-ending turnover of good luck. 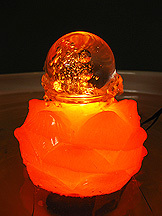 The lights fire up earth energy inside the crystal thus strengthening its power further. There are three directions which always benefit from water, which is the north, east and southeast. Conventional practice of feng shui suggests placing waters in these areas to activate water and wood element according to 8 Aspirations Theory. When these areas are activated, it benefits the entire household. 1. The north generates career luck and its direction element is water. So, when you use a good water feature in the north, you see desired results in promotional luck in your career and increase of sales to flourish your business. Meanwhile the east with trigram chen has its base element wood. 2.East is the direction of the dragon and is filled with the most cosmic breathe of the dragon. It benefits the whole family by bringing health, longevity and descendants luck. It also promotes growth. A good water feature here would feed the wood and let the energy blossom to realize your aspiration. 3. The southeast brings prosperity and belongs to sun trigram with its base element wood. The type of luck brought by activation of this area with water feature is increased in money and wealth, or simply higher level of regular income. If north, east and southeast of the whole house is the bedroom, you may choose to use the small tai chi method of activating the north, east or southeast of the living room, family room, study or dining room to generate the same results. For Flying Star practitioners, old Feng Shui masters often advised them not to worry about the possibility of unlucky flying stars such as #2, #3 and #5 occupying any of those directions. It will not activate the unlucky water stars which could bring inauspicious luck. Reason is because #2 and #5 belong to earth numbers. Water can hardly strengthen them, especially when they are cured already with strong metal windchime, 5-Element Pagoda or wulou. In addition, although #3 (wood energy) could be strengthen by water, as long as it is being suppressed by red furnishings or laughing buddha, a water feature cannot magnify a quarrelsome event that could lead to disasters unless the feature is as huge as a swimming pool. Classical Compass Feng Shui masters often claim that the fastest and most promising method to improve finances is to find the auspicious "water star" (facing star) of the reigning number of the current period and activate it with a correct water feature. Although there are many theories about generating wealth, this system of feng shui gives the most faith to watch money start flowing in till richess is attained. The reigning number in Period 8 is "8" and it is this star that rules for this 20 year-cycle (ending 2024), therefore the wealth star is water star #8. This is the money spot of the house and where money luck can be harvested effectively. Once this water star #8 in any type of houses is activated, it promises prosperity for the whole household, irrespective of which period your house belongs to. Another fine aspect to take note of is the secondary wealth corner. For all houses built in period 8 or being renovated into a period 8 house, placing an extra water feature in the Southwest in specific is considered very lucky. This is the "special energy" of the property and activating the "special energy" besides the water star #8 makes one even richer. Our Feng Shui Scholars have summarized in the tables below the locations of the water star #8 for houses or premises built in Period 7 and Period 8 for your easy reference. The location of flying stars in a building are determined by the time aspect of completed construction and the facing direction of the building. In terms of facing direction of the building, there are altogether 24 subdirections (each subdirection takes 15 degrees) which is considered in arranging Flying Star map of houses, therefore resulting in 24 types of houses. To determine your home's facing direction, you must first find the sitting direction. The sitting direction is the direction your house or apartment unit lean against. It is usually the side corresponding to the backyard or alley for a house, or rather the yin part of your house. Once you have located the sitting or backside of your house, the facing direction is magnetically opposite. One mistake most people make is to use the position of the front door and that could cloud your judgement. In Classical Feng Shui, the front door plays no role in determining the sitting and facing sides of the building or unit in question. The maindoor facing direction is not used in determining flying star feng shui, although it is used widely in Eight Mansions Theory when we want to synchronize with our good directions. We advise that if you have sufficient space in your living space, do not limit yourself to just activating your water star #8 location of the whole house (big tai chi). You can also activate similar locations for individual rooms such as living room, study room, home office, family room and dining area (small tai chi). And for those whose big tai chi location of the water star#8 is in an area unsuitable for water feature to be placed there, example bedroom, toilet or store room, you can make use the the small tai chi locations where suitable. This has been discovered by Feng Shui masters to be good enough to generate similar effects. What if the water star #8 is in the south? South is fire and placing water there is thought to clash with fire. This is not thought to be so by Classical Feng Shui Masters with extensive knowledge and intepretation in Flying Stars and 5 Element Method. It is believed that when water star #8 flies to the south, it creates opportunity for fire and water to be present together producing steam, thus generating more energy and power. Therefore for the purpose of activation of water star #8 in the south, it would attract prosperity that comes with power and authority. You can do it with confidence. Note: Please make sure you use a proper compass to take directions when identifying your auspicious and inauspicious directions. Replace luck with a reliable compass. Click here to buy a good compass.